The original Road Runner theme, in all its glory. 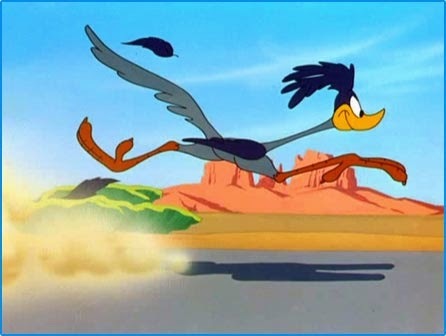 I suddenly realized that this site has almost no references to the Road Runner Show - and how can an animation site omit that! Anyway, this is an American treasure. They even used to put road runner paint jobs on camaros and such. And I know there are road runner fans out there! Here's another copy if that one doesn't work. "The ... Load Lunner... Show." I know I'm not the only one who has noticed this, there was a similar reaction back in the day forty years ago, when the true Road Runner fans would be like, "Yes, but have you heard the Korean version, it's even better!" Yes, that really was a fairly common reaction back then. Below is the same theme, over the end credits. The truly observant will note the presence in "Additional Voice Characterizations" (there was someone else besides the two stars?) of the legendary June Foray, who is still very much going strong as of the date of this writing (2014) as a voice actress. The legendary animator Chuck Jones also is listed in the "Stories By" section. Mel Blanc, who was also doing Barney Rubble around this time, was the main voice guy - talk about a talented lineup!